AT the corner of Church Lane, Holborn, there was a second-hand furniture dealer, whose business was a cross between that of a shop and a street stall. The dealer was never satisfied unless the weather allowed him to disgorge nearly the whole of his stock into the middle of the street, a method which alone secured the approval and custom of his neighbours. 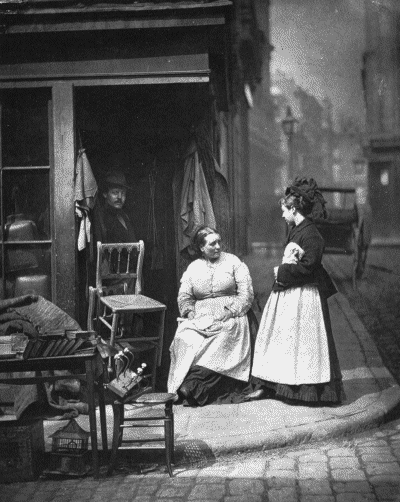 As a matter of fact, the inhabitants of Church Lane were nearly all what I may term "street folks" - living, buying, selling, transacting all their business in the open street. It was a celebrated resort for tramps and costers of every description, men and women who hawk during the day and evening the flowers, fruits, and vegetables they buy in the morning at Covent Garden. When, however, the question of improving this district was first broached, Church Lane stood condemned as an unwholesome, overcrowded thoroughfare, and the houses on either side are now almost entirely destroyed, and the inhabitants have been compelled to migrate to other more distant and less convenient parts of the metropolis. This lane was not certainly one of the worst streets in the neighbourhood, but it stood in disagreeable proximity to New Oxford Street, and the tax-payers of that important thoroughfare had to be conciliated. When the furniture dealer found that his customers were thus one by one leaving the quarter, and that the most elaborate street display of his goods failed to attract any buyers, he was ultimately obliged to join the general exodus. The accompanying photograph will, therefore, recall the entrance of Church Lane as it used to be in the olden time, and yet remained till the beginning of the year 1877. It will also afford a striking contrast to the improvements which are now about to be realized. Furniture dealers of this class, that is to say, the men who cater for the poor, generally obtain their stock from brokers and bailiffs. They will buy up the entire furniture of a poor household for a given sum, without discussing in detail the separate value of each article. Of course, the greater portion of the goods thus obtained are more or less old, damaged, and some even broken into fragments; but, to the secondhand dealer, no article of furniture can be so entirely destroyed as to be totally useless. He will contrive, with two broken chairs, to make one sound one. The boards taken from one chest of drawers will serve to repair another which may be in a less dilapidated condition; and when once old furniture, particularly a chair, has been repainted, repaired, varnished, or polished, it is impossible to distinguish any difference between an old and a new article, if both are made after the same model. Unless pieces are hacked out of the framework, an old chair may always be made to look new. Even if the wood is damaged, four sound legs may generally be selected from two old and battered chairs, so that one sound piece of furniture is thus produced. But in this business considerable skill and ingenuity must be exercised, and an extensive knowledge of cabinet-making and upholstery is indispensable. For this purpose, the second-hand furniture dealers generally secure the services of a sort of nondescript artisan, who is usually called the "handy man." He is, in a word, the very opposite to the specialist. He can do a little-perhaps very little-but still a little of every style of work, so that he can always patch up, improve, mend, or adapt to some new purpose, whatever second-hand furniture and lumber his employer may buy. The handy men are, therefore, the genii of this trade; and yet they are often recruited from the street. Some have never been apprenticed as cabinet-makers or upholsterers, but have led a wild, errant life, learning from necessity how to exercise whatever latent power they possess of invention or contrivance. Sometimes the men who wander about the streets seeking chairs to mend develop into "handy men." They begin by offering to put new cane into the chairs they may notice in shops requiring repair of this description. Then, while on the premises, they look about for some other and different kind of work, and sometimes succeed in obtaining permission to attempt work of a higher description. After many failures, a man of ingenuity may pick up sufficient knowledge, if he has a natural taste for this craft, to be regularly employed as a handy man; and, having once acquired that position, he may so improve upon it as to render himself quite indispensable to his master. Thus these second-hand furniture shops are in some cases the stepping-stones which enable men of capacity and good will, to quit street life and join the great artisan class. Apart from the stock obtained from brokers, a certain number of articles are bought from the poor themselves. But it is curious to note all the circumspection that must be displayed in this phase of the trade. The proverbial pride of the poor has to be conciliated with elaborate care. In this respect the pawnbroker has a decided advantage. A small parcel can be taken in and out of his pledge shop without necessarily attracting the notice of the neighbours; but a chair, a table, a large, heavy article of furniture, cannot be so easily removed. It is, therefore, only as a last resort that the furniture is sold; and even then the dealer is told to observe innumerable precautions. He must come and fetch the things away himself, and that only after dark. He receives special injunctions not to make any noise on the stairs, and if he should be so unfortunate as to meet any other tenant of the house, he must pretend that he is only taking the things away to be repaired, re-varnished, or otherwise improved. Unfortunately, these artifices are not often rewarded by success. When a poor man begins to sell his household furniture he is not far from the last steps in the downward direction. He may disguise his misery at first, but it soon becomes apparent to all, and the furniture dealers have but little faith in the utility of the precautions they are so often required to practise. As a rule, second-hand furniture men take a hard and uncharitable view of mankind. They are accustomed to scenes of misery, and the drunkenness and vice that has led up to the seizure of the furniture that becomes their stock. Then they have also to be thoroughly acquainted with the various forms of swindling practised in auction rooms; while, on the other hand, the customers who buy from them are not often very creditable people. The surroundings of the trade are, therefore, calculated to engender suspicion, harshness, and perhaps dishonesty. In all cases there is a tendency to sacrifice principles for the sake of securing a good bargain. At the same time, it is only fair to add that these shops afford facilities to persons whose means are very restricted, and enable them to furnish a home and thus obtain an established position. The furniture sold by the "tally-man" is far dearer, and often not so good, though advertised as new. A good second-hand article is generally preferable to the new shoddy ware sold at a higher price, and hence the popularity enjoyed by furniture dealers whose shops may be found in our back streets. A.S.